FREE Literacy Articles: Attention teachers, librarians, principals and reading specialists! Matthew has a collection of free literacy articles and lesson plans to help schools prepare for Matthew’s author visits. As a musician, publisher, and award-winning author, Matthew Gollub celebrates reading for FUN. 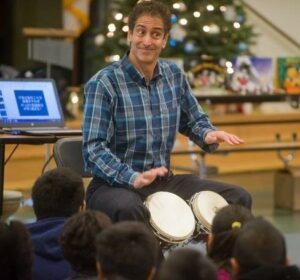 He combines humor, practical insights, storytelling, and drumming to thoroughly engage listeners of all backgrounds and ages. Each year, Matthew speaks at over 60 schools and education events around the U.S. and abroad. For more information about his keynote addresses, bilingual workshops, and singular school assemblies for grades pre-k through 8th grades, please click on a link below. For more about Matthew’s author assemblies and bilingual family literacy events, please contact Matthew here, or call him toll free at (866) 4 TORTUGA.